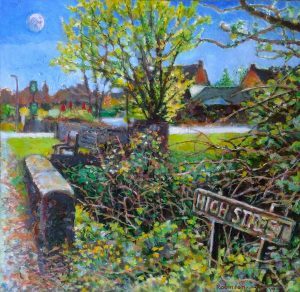 This painting shows the very edge of the village or the first thing you see of the line of buildings as you enter the High Street with the Lamb pub on the right. The battered old sign looks like it is being reclaimed by the overgrown brambles by the brook with the old bridge. The eerie light that is neither day nor night hints at the supernatural and witchcraft as it is said a white witch lived at this end of the village once.